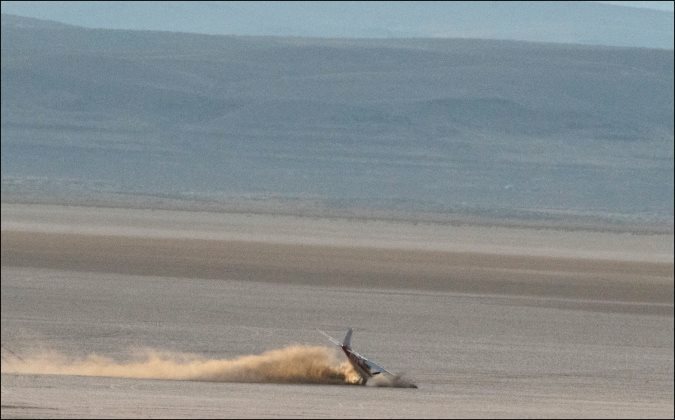 On October 27, 2018 about 0750 Pacific daylight time, a Cessna 182G airplane, N3267S, experienced a landing gear collapse during the landing roll on a dry lake bed near Burns, Oregon. The private pilot and two passengers were not injured; the airplane sustained substantial damage to the left-wing strut. The airplane was registered to and operated by the pilot under the provisions of Title 14 Code of Federal Regulations Part 91. Visual meteorological conditions prevailed, and no flight plan had been filed. The personal cross-country flight departed from Caldwell Industrial Airport, Caldwell, Idaho about 0745 mountain standard time with a planned stop near Burns. The pilot stated that the purpose of the flight was for him and two other airplanes to make a stop in the Alvord Desert near Burns and then continue on to Denio, Nevada before returning back home to Caldwell. Upon approaching the intended landing area, the pilot performed a high reconnaissance to assess the wind conditions. He observed the two other airplanes landed before him and configured the airplane with the wing flaps in the full-down position. The airplane touchdown and during the landing roll, the left-wing dipped downward. He applied left rudder and right aileron in an attempt to correct the left wing's attitude. Despite his efforts, the left-wing made contact with the ground before coming to rest with the left main landing gear sheared off and the nose gear had collapsed. A witness reported that she observed airplanes landing on the flats and decided to take photographs that captured part of the accident sequence. (refer to picture 01). She stated that the accident airplane touched down and the airplane suddenly pitched up in the air with the nose being pushed into the desert terrain. A Federal Aviation Administration inspector that examined the wreckage stated that the left main landing gear attach bolts had an appearance consistent with having sheared as a result of materials failure. The landing gear was retained for further examination.